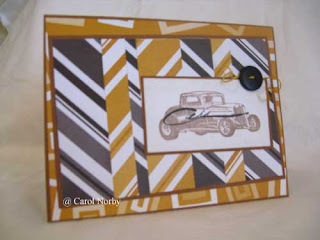 Stampin Carol: Zig Zag goes the car! I've seen cars around here zig and zag but this car doesn't! Zig Zag refers to a technique in the Technique Junkies Newsletter (click on banner in sidebar for website)! Isn't this cool!! I used some retired Designer Paper, brown and white cardstock and our Cars stamp set. I stamped the car in Burnt Umber PH ink then overstamped it with the text in Noir PH ink. I added a button and white scrappers floss that I colored with Raw Sienna PH ink. Great masculine card! I will be posting a tutorial on Sunday of the Post It Note Holder I created last week. Stay tuned!! Don't forget the free drawing that TAC™ has going and my used stamps for sale. All the info is in the sidebar - just click on the pictures! Ohmigosh Carol! I LOVE how you mixed not only the stripe direction but the COLORS too. Fabulous idea. And one in which I'll be sharing at my remaining August classes. Love the mixing stripe.. Cool idea! I want to try soon.